As a general safety measure, always check that your cutter is not in contact with the workpiece before switching on. If it is, you might go one way and the wood the other! At the other end of the cut, come well out of the workpiece. 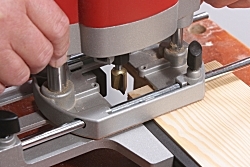 There’s a great tendency to slow down as you reach the end of a cut and it’s easy to top too soon, switch the router of and clip the corner off your workpiece. Remember the advice to the aspiring athlete. ‘Don’t run for the tape, run for an imaginary point two metres beyond it’.